Oven-baked with love, right here in the USA, our Supreme Source® Grain-Free Gourmet Biscuits are carefully sourced with all-natural ingredients and without any artificial colors or flavors. Our Lamb Meal and Sweet Potato recipe are grain-free – that means no corn, no wheat, and no soy. Due to the nature of grain-free ingredients, you may find a broken piece here or there. We promise, every bit and bite tastes just as delicious. A great source of high-quality protein for your dog because it contains more protein than fresh lamb. High in fiber and a great source of potassium, manganese and phosphorus. Potatoes also contain a variety of phytonutrients that have antioxidant activity. 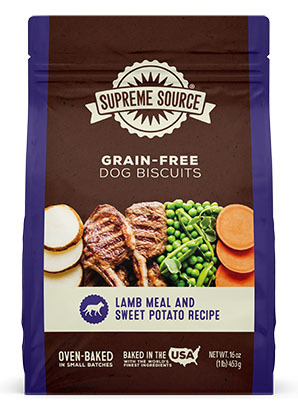 Lamb Meal & Sweet Potato Recipe Dog Biscuits is rated 4.4 out of 5 by 8. Rated 5 out of 5 by sousham from Such a great treat for dogs I have two rescue dogs - one who can eat whatever she wants, and the other who has had complications with some food and treats. I have sought high and low for a dog treat with the right ingredients at a reasonable price and that my dogs still want to gobble up when they receive it. These treats are it! My 8 month old puppy has an intolerance to certain proteins, but the Lamb Meal & Sweet Potato Biscuits have solved all of our problems! Thank you! Rated 5 out of 5 by Becky from Shilo loves them! We received a sample when The Good Stuff Pet Truck came to our dog park. Shilo, my German Shepherd can be very picky. When I gave it to her, she loved it! Rated 1 out of 5 by Ruthie from Contains White Potatoes I would have never purchased this products if had had realized it had white potatoes in it. White potatoes are members of the nightshade family of vegetables and can make pets very sick. I noticed that several companies are adding potatoes and nightshades to their products. This is much worse than grain. BEWARE PET LOVERS OF PRODUCTS WITH NIGHTSHADE VEGETABLES ABD DI YOUR RESEARCH. Rated 5 out of 5 by Tracy from My 4 Australian Shepherds love this food I have been buying this brand of dog food for the past 3 years! Never an uneaten meal. Our 4 Aussies are healthy and happy. Plus they love the dog biscuits too! Rated 5 out of 5 by Tammy from My 3 fur buddies love them! We just bought the treats after visiting a pet source truck in our state. They are now our favorite treats to buy at the grocery store. They love them! Rated 5 out of 5 by Maestrasteph from My dog loves it! It's the only food we have found that doesn't upset our dog's stomach! He loves it too! 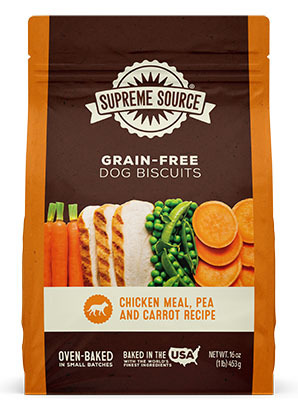 Supreme Source® Grain-Free Lamb Meal and Sweet Potato Recipe Dog Biscuits are intended for intermittent or supplemental feeding only. We recommend not to exceed two biscuits per 10 pounds of body weight per day. Lamb Meal, Sweet Potatoes, Peas, Potatoes, Tapioca Starch, Potato Starch, Poultry Fat (Preserved with Mixed Tocopherols), Ground Flaxseed, Natural Flavor, Gelatin, Rosemary Extract. Vitamin A 1,000 IU/kg Min. Vitamin C (Ascorbic Acid)* 5.0 mg/kg Min. CALCULATED CALORIE CONTENT (ME): 3,273 kcal/kg., 33 kcal/biscuit. And kibble is for dinner. Our grain-free food contains a healthy blend of fruits and veggies and no corn, wheat or soy.